A couple of weeks ago Steve Linscombe sent me an e-mail about www.riceloop.com – a new online forum for the international rice industry. Last Wednesday, I took some time to check out www.riceloop.com. In a few short moments, I set up my account. This is a very simple, painless process (see below for step-by-step instructions). When I set up my profile, this is the description I submitted to describe myself: “Associate Professor/Extension Entomologist at LSU AgCenter in Baton Rouge. IPM for rice, sugarcane, fruit and nut crops. Runner, biker, nature-lover. You can follow me on twitter: @NatHummel. I also maintain a blog: http://www.louisianariceinsects.wordpress”. To test the waters I posted one comment “Hey Rice Community – is anyone out there using blogging or social media to interact with their rice producers?” Within 12 hours I had five comments from three different people. Now, if you’ve used any online forums or other forms of social media you’ll realize right off that five responses in such a short time indicates an engaged, active community. I was curious to learn more, so I dug into the site. One of the first responses to my post was from Nelson M. – a riceloop member from Brazil who wrote, “Thanks, Natalie. I appreciate your work and I am an avid reader of research done at LSU.” This is a pretty exciting start to a dialog for someone who often posts in the online world – it often feels like information is being cast into a “black hole”. Here I was learning first hand that the rice industry in Brazil is reading the blog. Exciting news! I was also warmly welcomed by Kevin Ries from Largo, Florida – his description read: Rice Futures Trader/Analyst. Was one of the original rice futures traders at the New Orleans Commodity Exchange then traded in the rice futures pit in Chicago for nearly 20 years. Another member, Milo H. Both also welcomed me to the riceloop community. On Thursday morning, I received an e-mail from Kevin Ries requesting that I give him a call to discuss riceloop. I had a few moments between meetings and so I gave him a call. The story of riceloop is so fascinating that I thought I’d share it with y’all. Kevin is a rice futures trader/analyst. He started working in Louisiana, then moved on to trade in Chicago, before he ultimately created firstgrain.com with his partner Milo Hamilton. Kevin has found that rice, while being one of the most important food grains in the world, is produced and distributed by a population that is cast across the globe is often disconnected. He wanted to find a way to connect people across great distances. He wondered, can I create a way to easily connect rice farmers from Vietnam with those from Louisiana? What Kevin is trying to accomplish with http://www.riceloop.com is to create a “flat earth” for communication about what’s happening in the rice industry worldwide. Kevin quoted some impressive stats to me. RiceLoop launched on July 10, 2011. Within 10 days it had more than 150 members from 16 different countries. The loop is successfully linking rice industry folks via an easy-to-use online forum. Kevin is very open to ideas to improve the structure and useability of the page. After our conversation I explored it a little more and sent him some ideas. The success of this project will rely on the amount of participation from all aspects of the industry, across the globe, it’s a resource that is free for us to use to dialog about rice. I encourage you to check it out. I sent out notices via facebook and twitter and am pleased to see that about a dozen people from Louisiana have joined in the past week. 2. Create an account. You have an option to upload a picture of yourself from your hard-drive, indicate your location (Country, State, and/or City), your industry type, and a little bit about you. 3. Check out the public loop – this is the place where people post questions/comments/observations related to rice production/marketing/trade. 4. Reply to posts in the public loop by leaving a comment – you simply hit the “leave a comment” button and start typing. 5. You will receive an e-mail if someone replies to your post. 6. You can track posts created by other people. If you do this you’ll receive an e-mail if someone replies to the post – this allows you to track the conversation about a particular topic. 7. You can create a “private loop” which can be used to communicate with a select group of people you have invited to join in your “private loop”. 8. You can also find members by searching geographically or by industry type. 9. One additional feature includes the ability to send direct messages to riceloop members – this allows you to have more detailed conversations off the forum page, if needed. I’m curious to know what you all think about this new communication tool. Are you using http://www.riceloop.com? What are your thoughts on this type of resource? Do you have any suggestions for improving the format/user-interface? About a week ago Calcasieu Parish County Agent Jimmy Meaux e-mailed me a picture of a borer larva in rice that he suspected was the Mexican rice borer (MRB). This was a highly suspect sample due to a combination of the morphology of the larva and where it was found – which was in the same area where LDAF caught the first adult MRBs in pheromone traps in Louisiana. This confirms our suspicion that MRB are now establishing and reproducing in Louisiana. I would strongly encourage you to familiarize yourself with identification of this pest. Below is some information on this particular field infestation from Johnny’s Saichuk’s field notes. Following this I’m including some information on identification of MRB. “Well, it is official; we have the Mexican rice borer in Louisiana. Earlier reports were of male moths caught in pheromone traps. Last week county agent Jimmy Meaux was called to a field in Calcasieu parish where he tentatively identified borer larvae as Mexican rice borer. He sent them to Dr. Natalie Hummel whose associate Anna Meszaros and graduate student (under Dr. Gene Reagan) Julien Beuzelin examined the specimens. They confirmed the identity. This afternoon I visited the field with Jimmy where we easily found several borers including the one shown here. I sent the photo to the experts and they just confirmed it. That is one of the advantages of the technology we have today. The photograph was taken at 2:12 p.m. and by 5:30 it was confirmed. Mexican rice borer larvae infesting a rice plant in Vinton, LA. Photo by Johnny Saichuk. The LDAF MRB trapping program is an ongoing survey program in southwest Louisiana that is documenting the spread of this pest. LDAF state entomologist, Tad Hardy, sent me an updated map on the trap counts of MRB in Louisiana. If you click here you will see a Map of MRB Finds as of July 2011. This map was provided by Mr. Tad Hardy of LDAF. 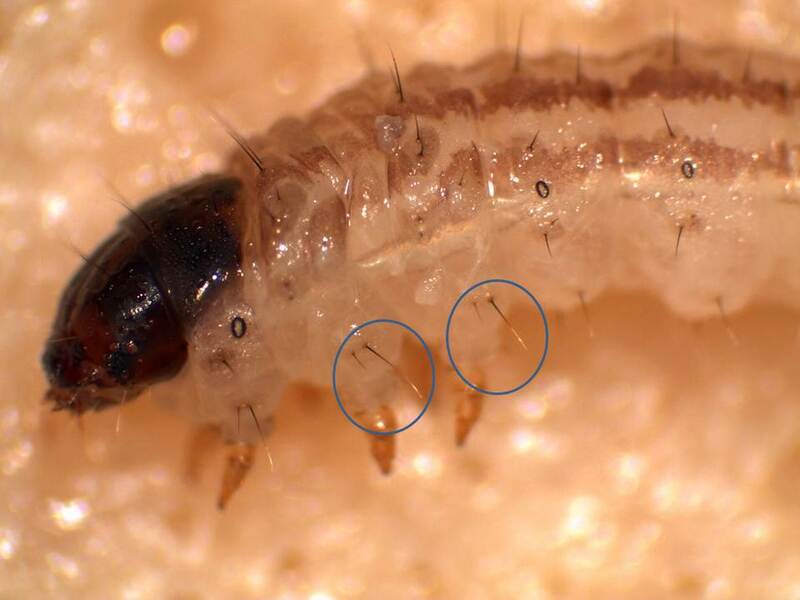 As Johnny said in his comments, fortunately the MRB is a manageable pest – in large part due to the efforts of LSU AgCenter sugarcane Entomologist Dr. Gene Reagan who has been studying this pest in Texas for decades. MRB effects both sugarcane and rice production in Texas and it appears that it will be something we will be managing in Louisiana also. The first step is to learn to properly identify the pest. There are a few key characters that will get you most of the way toward identification, but to truly confirm the species you need to view it under a dissecting microscope. If you find specimens that you strongly suspect are MRB you can send them to me and we will confirm the identification. Following are two pictures taken by Anna Meszaros that illustrate the key character used to separate MRB from the rice stalk borer. 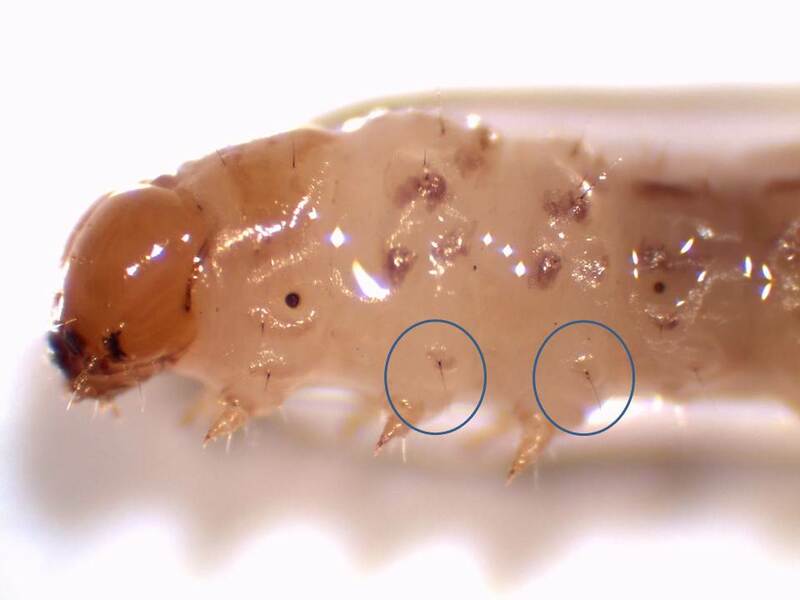 Mexican rice borer larvae - note the honey colored head capsule and the presence of a single seta (hair) on the meso and meta-thorax dorsal (above) to the proleg. Photo by Anna Meszaros. 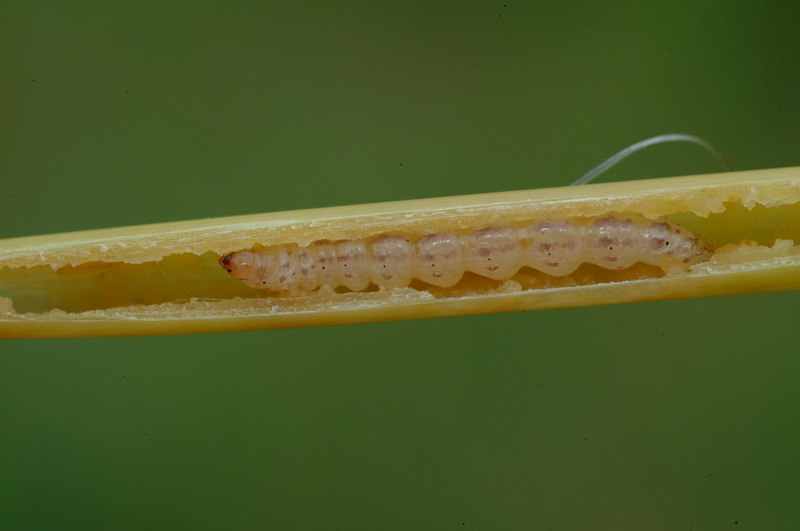 Rice stalk borer larvae - note the dark brown head capsule and the presence of two setae (hairs) on the meso and meta-thorax dorsal (above) to the prolegs. Photo by Anna Meszaros. Update: The section 18 has been amended to reflect LSU AgCenter treatment thresholds. Read on for more information. A Section 18 request has been approved by EPA for the use of Tenchu 20SG on up to 50,000 acres of Louisiana rice. This product will provide an alternative mode of action to the pyrethroids that are currently registered for use in Louisiana. The exemption expires October 31, 2011. The distributor in Louisiana is Mr. Michael Hensgens with G&H in Crowley. According to Mr. Hensgens, the suggested retail price is $24.30 lb at ½#per acre = $12.15/ac. Rate and restrictions: Please contact your local County Agent for a copy of the Section 18 registration before using this product. Remember that the label is the law! The registered rate is from 7.5 to 10.5 oz of product per acre. A maximum of two applications can be made per acre per season. A seven day pre-harvest interval must be observed. Be aware that this product is toxic to honeybees – read attached documents for precautions to avoid bee injury. Treatment threshold:We do not recommend treating until you exceed the recommended thresholds as described in the Section 18 label. To scout for rice stink bugs in the field, use a 15-inch diameter sweep net, take 10 sweeps at 10 different areas around each field. Count the number of bugs collected after every 10 sweeps and then treat if they exceed the threshold as described in LSU AgCenter Publication 2270. During the first two weeks of heading, treat when there are 30 or more stink bugs per 100 sweeps. From the dough stage until 2 weeks before harvest, treat fields when there are 100 stink bugs per 100 sweeps. 1. Resistance. Please notify us if you believe that you have a stinkbug population that is resistant to pyrethoids. We will gather insect samples to run laboratory bioassays. 2. Efficacy. If you use Tenchu 20SG we would appreciate any data you gather on residual efficacy of the product. Data from Texas has indicated that it provides a longer window of activity than pyrethoids. This will potential result in a reduction of the number of insecticide applications to a field in one season. We will be conducting efficacy trials in Louisiana to measure residual efficacy when compared to pyrethoids. If you’d like to participate in a field demo, please contact your local County Agent and they can work with me to make arrangements. 3. Milling. We also need your assistance in gathering data on milling quality of rice. Specifically, we need more data on reductions taken at the mill in the form of peck and broken grains which is attributed to Rice stink bug feeding injury. Rice harvest has already begun in some portions of southwest Louisiana. I will be posting a survey in the next month to gather more data about milling. Please contact me if you need additional information. The last couple of weeks have been busy with rice field meetings – both at the Rice Research Station and in Vermilion Parish. Last weekend we gathered for the 89th Annual Louisiana Farm Bureau Convention in New Orleans. Not everyone can attend these meetings but, thanks to advances in technology, you can experience them virtually. One way to do this is by using twitter. I tweeted speaker comments from the meetings. If you’d like to follow my twitter feed my handle is @NatHummel. You can also see it displayed on the right-hand column of the blog. I’ll be speaking at the Northeast Louisiana Rice and Soybean Field Day on Wednesday, July 13, 2011. The field day will be held just north of Rayville at the Elliot Colvin Farm (same location as last year). If you need directions please contact Richland Parish County Agent Keith Collins. Here is the agenda. Hope to see you at the meeting. I’ll make comments about early-season pest problems, rice water weevil management and rice stink bug scouting and management.